What is an EHR? Most currently working within eHealth circles will have a ready answer, and the classic response will be something like “an EHR is a software application that is used by clinicians for provision of patient care”. What do we want from an electronic health record? It’s not actually the application or the user interface or the workflow, but a record of health information in an electronic format. And so what of the health information itself? What is it? What do we want? What should we want? 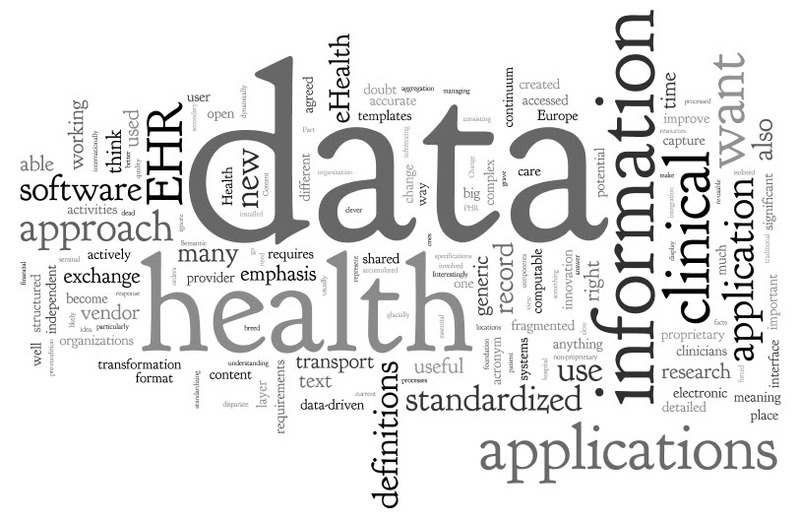 Let’s work with these definitions: Data are the computable facts; while health information is the data after it is processed, organized, structured or presented in a given context so as to make it useful. Is available at the right time and the right place to the right person. Is accurate, detailed and of high quality. I don’t think there is much disagreement on these two points. How about these next suggestions? Is a lifetime health record – cradle to grave. Health information that can be accumulated over time, aggregated from many sources to inform better care for ourselves, our patients and loved ones. Can be created in one place or by one provider and shared with others so that the meaning of the data is preserved and accurate. Can be dynamically and actively used – consisting of structured, atomized data that we can re-use and combine in different ways to improve our health and wellness. Documents or PDF’s of our health information are useful as part of a passive record, but they are effectively a dead end – we can’t do anything useful with big blobs of text except read them. Is not locked in to a proprietary vendor database; data should be in an open, non-proprietary format. Is a continuum of our health information across all aspects of healthcare and related activities, not fragmented silos of data artificially segmented for personal, clinical or secondary use purposes. Can be accessed via an EHR, EMR or PHR, SEHR or ICEHR – pick an acronym, any acronym! Can be accessed independent of any specific organizations, providers and geographical locations. Has had minimal transformation or manipulation. Keep in mind the Chinese Whispers effect! There is significant risk that important data can be lost or lose integrity with each data migration to a new software application or transformation between disparate systems. It is a commercial reality that we continue to develop EHR applications in the traditional manner, building the greatest and ‘best of breed’ clinical software applications, with each EHR vendor doing it in their own proprietary way, as ‘rugged individuals’! The resulting software usually has a rich functionality and a great user interface. It is likely that it does a fine job locally in the clinic, hospital or network on which it is installed. But what about regionally, nationally, internationally? Is it still working well if we take the big picture view? Sure, our EHR applications are full of data, but the data is isolated, fragmented, and limited in its use. The bolded text, above, reflects my emphasis on an important statement. Confirming this approach, as recently as this week, Kibbe & Klepper also called for separation of the data from the applications and from the transport layer. An unambiguous and detailed understanding of what each piece of data means so we can do ‘stuff’ with it – a tight semantic ‘handle’. A powerful enabler for managing the complex requirements involved in health data capture, integration, aggregation, inferencing and sharing. A continuum of our health information, independent of vendor, provider or organization – the real potential for lifelong health records, for the first time. There is no doubt that this approach is orthogonal to the status quo and it will be challenging to many for logistical, financial and political reasons, but can we really afford to ignore this? According to the European Commission’s seminal 2009 report entitled “Semantic Interoperability for Better Health and Safer Healthcare: Research and Deployment Roadmap For Europe” (PDF, p16), standardizing the capture, representation and communication of clinical data requires three components to represent meaning: a generic reference model for representing clinical data, agreed clinical data structure deﬁnitions and clinical terminology systems. Potential standardized data definitions proposed are openEHR archetypes, ISO/EN 13606 Part 2 (which are simpler archetype structures), HL7 templates, generic templates and data sets. Standardization of data is not ‘pie in the sky’ but an approach that has had significant research and implementation experience, particularly in Europe. So, to consumers, clinicians, organizations, researchers and governments, the call should not only be “Gimme my damn data!” but give me standardized data that is application- and message-independent. Then we can actually start to use and re-use our data, not only as a detailed record of current and past health conditions, events and activities, but dynamically and pro-actively to inform and promote our future health and well-being. This entry was posted in Health Informatics and tagged data, EHR, EMR, health information, PHR, standardised by Heather Leslie. Bookmark the permalink. You must be a software developer, not an end user. No one has figured out a “great user interface” that allows natural data entry. Some are merely less horrible than the others. If you look at standard textbooks on performing a history and physical, you will see that there are no EHR’s that accommodate that workflow. All the EHR vendors choose the same workflow. This is a patient safety issue. Thanks for reading and responding – no, I’m not a software developer. I was being somewhat ‘tongue in cheek’ with that phrase. My point is actually that even if you have the best functionality, interface and workflow, if the data is not reusable or easily shareable, then you just have another island of data – “isolated, fragmented, and limited in its use”.